A portrait of the German artist Walter Spies, who left Europe in the early 1920s for Java, then part of the Dutch East Indies. 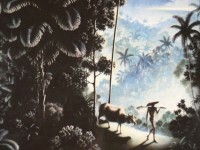 Spies settled on the island of Bali, in the hill town of Ubud, where his home and painting studio attracted a stream of visitors; including old friends – the writers Vicki Baum and Jane Belo were regular guests – and acquaintances, such as the English composer Noel Coward. After the outbreak of the Second World War, and the German occupation of the Netherlands in 1940, Spies was arrested by the Dutch colonial government in Java, and interned. He died in 1942, when the boat transporting German detainees to Ceylon was bombed by Japanese forces. One of the earliest of successive waves of expatriate westerners in the 20th century to fall under the spell of Bali, Walter Spies was deeply enamoured by the art and culture of his adopted home, immersing himself in its dance, ritual and musical traditions. In turn, Spies helped shape the development of artistic form in Bali in the decades between the wars, and fostered greater awareness of Balinese culture in the West. This program features the memories and recollections of Spies’s family and friends, including Balinese artists who were part of the cooperative that the German expatriate helped found in Ubud in the 1930s. It also draws on Spies’s own writings, and extracts from the unfinished novel of his friend, the writer Vicki Baum. Herrlich! Eingehend aber Spies heisst noch Spass. Schade nur dass Walter Spies australisch klingt. Eine Produktion, die für ABC in Australien entstanden ist. Deshalb …. !